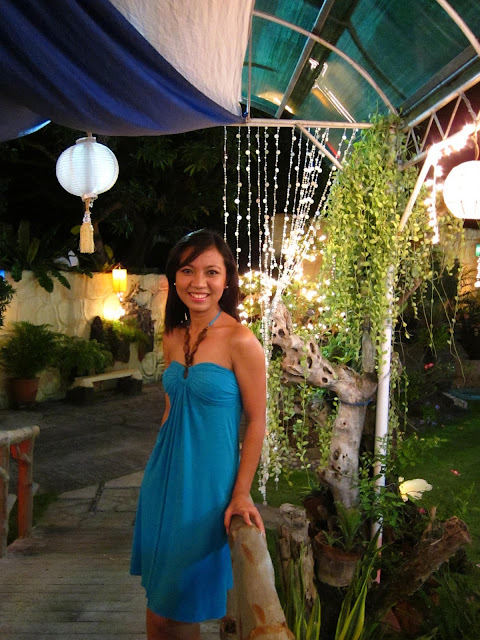 It was December of 2010 when a good friend of mine, Christine tied the knot with her long time boyfriend Nat. I was really happy when she sent me an invite to her wedding, plus the fact that she and Nat requested me to sing at the reception! I feel flattered since this was my second time to be given a chance to serenade friends on their wedding. I decided to wear this dress on the day of their wedding. 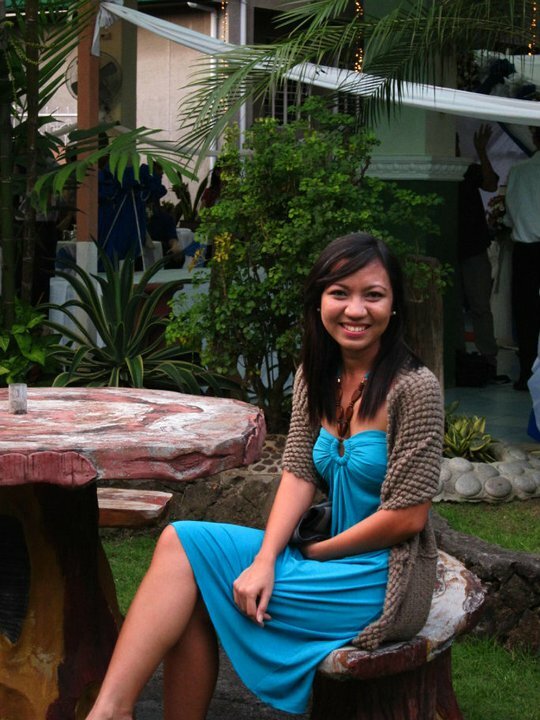 I bought this at Cinderella- Megamall Branch and I was happy that the style and fit of the dress suits me. It was comfortable to wear the entire day and the design gave me that feeling that it was appropriate for that moment when I get up on stage to sing. 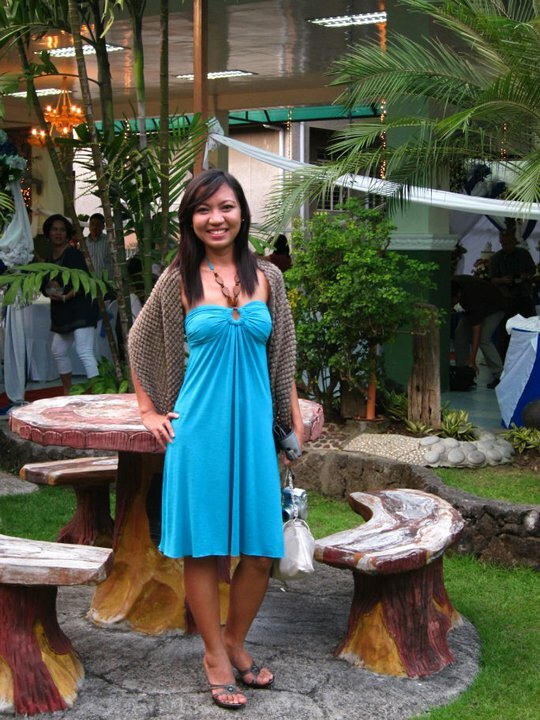 And since were to attend the wedding ceremony first, I brought with me this brown cover up I got from SM Surplus (P250.00) to make my dress suitable for church. I've been a fan of Gibi shoes ever since and this is one of those pair that I overused already. If you are familiar with SM Carriedo, that was the outlet that I always visit to get pretty pairs of Gibi sandals with great discount (I even bought a pair of stilleto there for P300.00). It has the right height for the heels and easy to slip on and pair with anything given the neutral color. 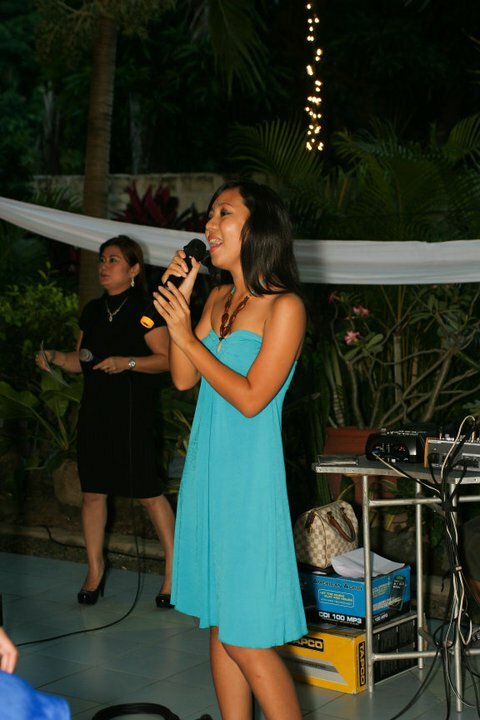 As requested by the couple, I sang "How Did You Know" by Chiqui Pineda that night. I admit that I was super nervous that night that I felt that my voice was not coming out of my mouth properly (one of those moments that you feel you could have done better), but I was happy that they were okay with the song. I was even surprised when Christine texted me that someone said that I have a beautiful voice (Wow! Thank you so much friend of Christine *smile* ). I was with our other friends so all in all that special day ended up with lots of memories and fun times. We were dropped by our friend at SM North Edsa and we saw this beautiful setup at the activity center. And since we were still dressed up, we couldn't resist the idea of having our pictures taken while sitting on this beautiful sofa. It's almost three years and I know that the couple are still having an awesome married life. I hope I see them soon if ever our schedule permit a meetup. But for now, I'll continue to wish both of them a happy and blessed life as couple. And maybe a baby soon? Haha! 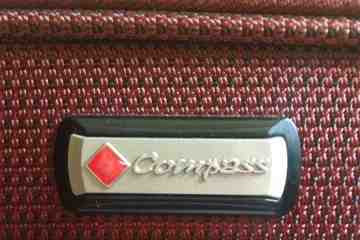 Thanks again Christine and Nat! Ooh! I like your dress. Especially when you took off na the cover up. It looks laid back, tipong pwedeng pang-evening sa beach and yet still formal enough for a wedding. hi kristine!Yeah you are right. I didn't think of wearing this while at the beach. Maybe next time :) thanks for the idea!